Using water as a reference, these paintings serve as an abstract investigation of empathy. There are a number of ways to approach easy questions in the world. "Why is the sky blue?" I could use scientific language to explain how solar photons and ozone interact and how the rods and cones in our eyes interpret those interactions. The simple question might be the wrong question though--forget what you know about photons. On this June day in the garden, observe a warm orange sunrise, a black huff of thunderheads, and the ultraviolet gloaming of a firefly hunt.With the observable world constantly spinning through the spectrum, I am trusting these paintings to help me ask a tougher question. I know we are made mostly of water, but what wet and unobservable thing ripples inside of us, helping us find communion with the people we love? MBG: I know you have worked with water as a recurring theme for many years now. What was the initial catalyst for watery imagery to become dominate in your work? Chandler Pritchett: I grew up on Mobile Bay in the rainiest city in the country. My earliest understanding of the power of water had as much to do with tidal jubilees as it had to do with observing the effects of hurricane's storm surge. Water was a source of nourishment as well as a leveling force that, while completely destroying a landscape, also creates an empty space for new development. 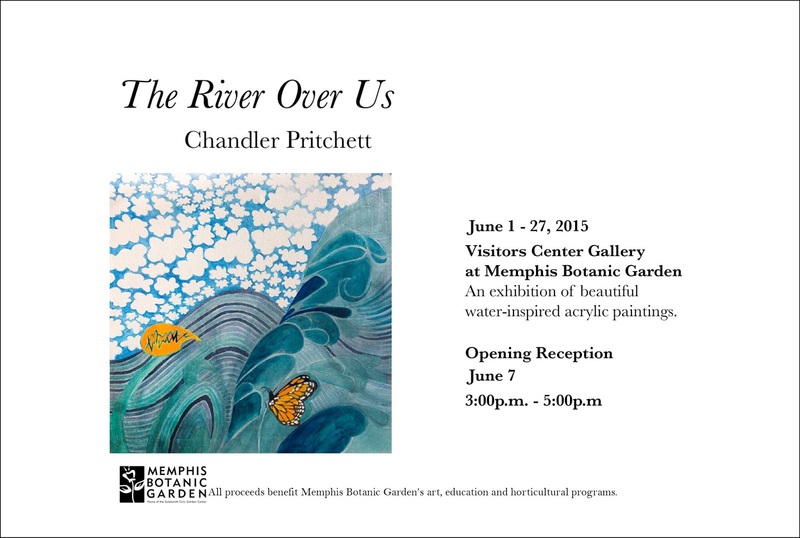 When I started this body of abstract painting, I was paying special attention to the more subtle conversations about water taking place in Hamlett Dobbins' paintings and Ballet Memphis's ongoing River Project series. I was also studying chemistry and physics and thinking about the nature of particles and waves traveling through water and in the form of light. Once I brought these initial catalysts into my understanding of painting, I had this great feeling of being swept up into something bigger than myself and I was able to paint quickly and intuitively, better understanding how my images fit into a larger cosmos. MBG: You mention investigating empathy in your statement about the pieces in this exhibit. Can you speak more about some things you've discovered about empathy during this investigation or its importance to you? Chandler Pritchett: Art is a great way to connect with people on an emotional level, so empathy is an important tool for any artist. There's a real impulse for me to use my work as a way to understand how a challenge is diffused, transformed or healed. I think that anyone who observes the way waves ripple across a pool will understand the way people in conversation can come together, affect one another, and then move apart in harmony. I have been very pleased with the way that abstraction has allowed me to immerse myself in these harmonic visual relationships. I was born in Mobile, Alabama. I received my undergraduate education at the University of Alabama then I moved to Memphis in 2005. I earned an MFA from UofM and exhibited across the southeastern U.S. I'm now starting dental school at Uthsc this summer! Learn more on my website...click here.